Toronto, February 9, 2011 – MaRS Discovery District is now part of the Ontario Network of Excellence (ONE), a network of 14 regional innovation centres across the province that help local entrepreneurs bring innovative ideas to market. As a member of ONE, MaRS will give entrepreneurs access to a broad range of experts, including researchers, academics, business, government and investors, who can help sell an idea and grow a business worldwide. MaRS will also collect and analyze regional economic, social, environmental and cultural data. Sharing this information with entrepreneurs and policy makers will support regional innovation economy planning. Supporting made-in-Ontario technologies is part of Ontario’s strategy to make innovation a driving force in Ontario’s economy, and support the open Ontario plan to build new opportunities for economic growth and jobs. 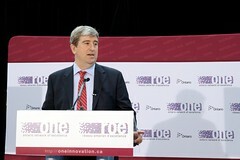 In 2008-2009, Ontario’s local innovation centres helped our province’s technology-based entrepreneurs and companies: create and retain more than 3,400 jobs, protect over 1,300 new ideas through patents and copyrights, develop nearly 900 prototypes, bring more than 700 products and services to the market and sell to more than 3,500 new customers. It is estimated that ONE will increase these numbers dramatically, by providing more coordinated, immediate and specialized help that is accessible across the province. In Toronto, local thinking and support for innovation has already produced successful companies like Quantum Dental Technologies. With the help of Quantum’s “The Canary System”, dentists may soon be detecting cavities using pulsating laser light, instead of metal explorer tools, enabling dentists to halt and treat decayed enamel. About Toronto innovation success stories. About the Ontario Network of Excellence. About the government’s Open Ontario Plan.